Add a touch of playfulness and color to a child's bedroom with the fun-loving iconic Curious George character. This bedding theme choice can prove to be a challenge since many of the items are quickly grabbed, but with a little searching you can find some options. Bedding with the famous monkey is offered in a limited number of retailers. In addition, you'll want to check private sellers on Etsy and eBay. Pillows and pillowcases in several prints, including personalized ones, are available. They're priced between $5 and $30. Crib sheets/bed skirt in Curious George kite or beach ball patterns are offered. You can buy them for about $20 to $50. Several cute fleece blankets can be found on Amazon as well as fringed tapestry throw blankets. Expect to pay between $30 and $70, depending on the size and design you select. AWE offers two bedding options in a Curious George pattern: a bed skirt and comforter. Comforter: The 100% cotton hugger comforter features classic Curious George images on a white background. The 200 thread count panel features 11" wide red gingham side trim. Two bottom corners of the hugger comforter are fitted over the foot of the mattress. It's available in full or queen sizes. It's priced around $90. Bed skirt: The bed skirt repeats the red gingham comforter trim with a bottom trim that repeats the comforter pattern. Pick it up for approximately $60. You can find vintage and custom handmade items such as blankets, quilts, sheets, pillowcases, crocheted blankets and other one-of-a-kind items. It's important to realize that bedding sets may not be officially licensed bedding products; instead, they might just be sheets, pillowcase covers, or comforters made from fabrics that feature Curious George. Prices vary depending on what you want and whether it's a custom piece, so a simple pillowcase might be $8 while more elaborate bedding is upwards of $150. You probably won't find this Redbubble duvet cover anywhere else. This brushed polyester duvet cover features a yellow top with Curious George heads printed on the front and a solid colored white back. The lovable character is making silly faces. The zipper closure and ties are concealed. Available in twin, queen and king sizes. It's about $95 to $145, depending on the size you select. There are a couple of Curious George bedding items that will make your child's bedroom unique at Sew Fine Things and More. This adorable 58"x 80" twin size quilt is made from a blue dot fabric featuring Curious George monkeying around. You'll pay about $150. The standard size white pillow case is decorated with Curious George wearing an oversized yellow hat. It costs about $6. 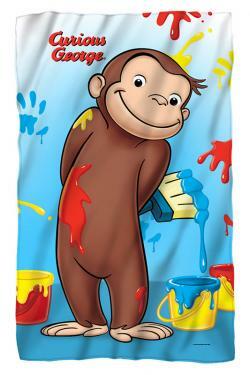 A 48"x 80" Curious George paint fleece blanket depicts a mischievous George with a dripping paint brush, several colored paint buckets and paint splatters on the wall behind him. You'll spend less than $50 for it. A unique 18"x 54"microfiber body pillow has a zippered closure. Expect to pay around $80 for the pillow. In addition to Etsy, eBay is one of the best resources for finding bedding items, both gently used and new, with a Curious George pattern. Bed skirts: A bed skirt will add flair to any bed size. 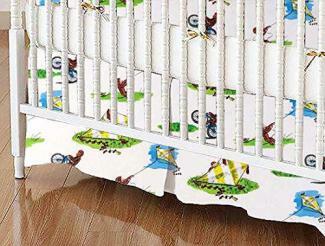 Crib bedding: Curious George is a fun motif for a nursery. Duvet covers and comforters: A duvet cover is a versatile bedding choice for any age. Several comforter styles are available. Pillowcases: There are several Curious George styles for the picking. Throw pillows: You can find a few of these to complete your bedding ensemble. Quilts: You can find a few custom handmade quilts in several Curious George patterns. 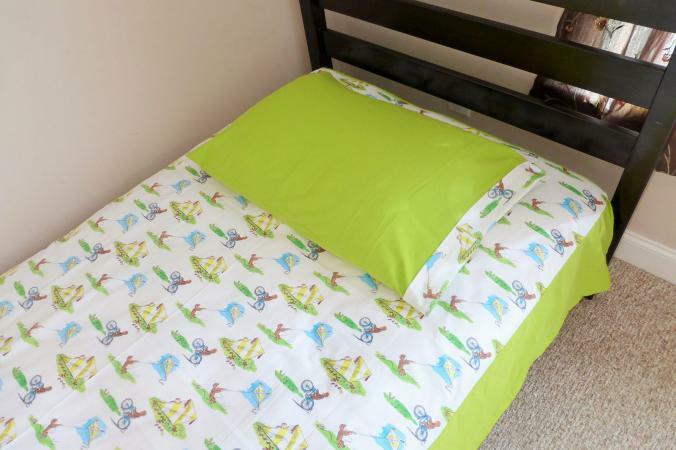 Sheets: Many of the sheets offered are crib size and ideal for a nursery. You can also find several Curious George accessories, such as wall stickers, murals, lamps and even fan blades to complete your themed bedroom design. The key to a successful décor is not to overstate the theme. Instead, you want to create a good balance between these iconic pieces and other colors and patterns. Bedding featuring the happy monkey can be added to an existing décor scheme. The patterns are typically bright and offer a great splash of color. Add a comforter and pillows to the mix or opt to re-design the bedroom using a more complex Curious George theme. No matter what you decide, your child will adore this playful monkey bedroom theme.